Mango Mint Chutney also called Kachhe Aam Aur Pudine ki Chitney, this Mango Mint Chutney condiment goes very well as a dip or spread with any Indian appetizers snack like samosa, Pakora or chaat. It will simply refresh your taste buds in summer. It is probably one of the most famous chutney in north India. Mango Mint Chutney is the perfect partnership of mango with aromatic native mint – the sour and tangy mango balanced with the fresh yet peppery mint flavor. The chutney keeps for up to a week if covered and in a refrigerator. 1. Wash and peel mango, cut into cubes and remove the hard part of mango (pit). 2. Add mango cubes, coriander leaves, mint leaves, green Chili, cumin seeds, water and salt in a blending jar. 3. Now blend it till smooth paste. Mango Mint Chutney is ready. 4. Remove it into a jar and store it into a refrigerator up to a week. • You can add or reduce spice level as per your choice. • You can add 2-3 garlic cloves if you like garlic flavor. • If you want thin chutney then you can add more 2-3 tbsp water while blending. 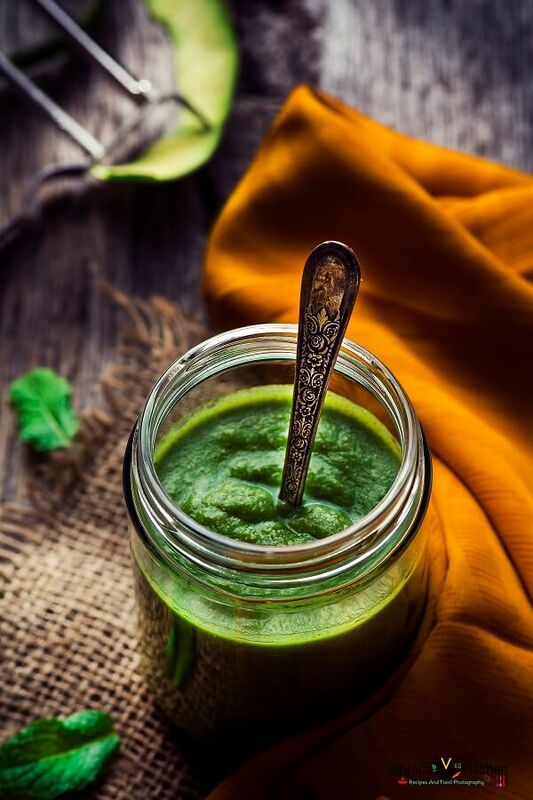 Mango Mint Chutney also called Kachhe Aam Aur Pudine ki Chitney, this Mango Mint Chutney condiment goes very well as a dip or spread with any Indian appetizers snack like samosa, Pakora or chaat. It will simply refresh your taste buds in summer. Wash and peel mango, cut into cubes and remove the hard part of mango (pit). Add mango cubes, coriander leaves, mint leaves, green Chili, cumin seeds, water and salt in a blending jar. Now blend it till smooth paste. Mango Mint Chutney is ready. Remove it into a jar and store it into a refrigerator up to a week.